This is the story of Portia Pig. Portia was different from all the other animals in town. They were always busy, busy, busy, doing Very Important Work. But Portia loved nothing better than to dream, and use her imagination, and paint beautiful pictures. Now, none of the other animals knew about Portia's beautiful paintings because they thought being an artist was a terrible waste of time. So, when no one was looking, Portia painted and painted. Then she hid her pictures so none of the other animals would know she was wasting her time. She hid them under her bed and in her closet and behind her couch and even in her refrigerator. Early one fine spring morning Portia sat beside a lake watching the sun rise. Beautiful colors spread across the sky, making the clouds all the colors of the rainbow - bright pinks and golds and oranges. Portia imagined that angels painted pictures in the sky. She could see a pink cloud pony, and a golden cloud tree, and an orange cloud mountain. It was all reflected in the quiet lake. Portia thought she had never seen anything quite so beautiful. She imagined painting this glorious sunrise and her heart sang with happiness. Just then along came Mr. Frog, hopping from lily pad to lily pad, carrying his Mail bag. "What are you doing?" asked Mr. Frog. "I'm having a wonderful time using my imagination," answered Portia. "Come sit with me and look up at the clouds. There's a beautiful pink cloud pony, and a beautiful golden cloud tree, and a beautiful orange cloud mountain." "Pish tosh," sputtered Mr. Frog. "I have no time for such foolishness. I have more important things to do. I'm off to deliver Very Important mail to everyone." And Mr. Frog hopped off to do his Very Important Job. "Tomorrow," she resolved, "I'll put away my paints and my pallete and my easel and I'll get a job as a letter carrier. Then I will be doing something Very Important for the town." But as Portia lay in bed that night trying to sleep, beautiful pictures of the lake and the sunrise and the pink cloud pony kept dancing in her imagination. "I'll just paint one more picture," said Portia and she got out of bed and painted the night away. All that spring Portia worked very hard delivering important mail to everyone in town. She was happy to perform such a Very Valuble Service but something was missing in her heart. She wished she knew what it was. not quite the job for her. One lovely summer day, while Portia was taking a walk, she came upon a garden. It was filled with beautiful flowers all the colors of the rainbow. There were red roses and yellow daisies and blue morning glories climbing over the fence. She heard bees happily humming and birds cheerily chirping. As she took a deep breath and smelled all the lovely flower smells, she imagined tiny elves tiptoeing through the flowers, spraying them with perfume. She imagined how wonderful it would be to paint the whole lovely scene spread before her and her heart sang with happiness. Just then, along came Miss Horse. "What are you doing?" asked Miss Horse. "I'm having a wonderful time using my imagination," said Portia. "Come and look with me," she said "and imagine talking to the bees and sitting in the trees with the birds." "Pish tosh," whinnied Miss Horse. "I have no time for such foolishness. I have more important things to do. I'm off to the farm to help grow food for the town." And off she trotted to do her Very Important Work. "Tomorrow, she resolved, "I'll put away my paints and my palette and my easel, and get a job at the farm and do something important for the town." But that night as Portia lay in bed trying to sleep, wonderful pictures of the garden and the bees and the birds kept dancing in her imagination. "I'll just paint one picture," said Portia. And she got out of bed and painted the night away. All that summer Portia worked very hard on the farm doing the Very Important Job of growing food for the town. She was happy to perform such a Valuble Service but something was missing in her heart. She wished she knew what it was. By the end of the summer Portia knew that farming was not quite the job for her. One fine autumn day Portia was walking through the woods marveling at the leaves. They were all the colors of the rainbow. Patches of golds and ambers, reds and oranges, browns and greens were lit up by the sun. Portia imagined a giant rainbow in the sky pouring colors on the leaves. As she walked, enjoying the cool, fresh air and the sound of fallen leaves crunching underfoot, she imagined wood sprites helping squirrels to gather acorns. She imagined painting the whole lovely scene. Portia thought she had never seen anything quite so beautiful. Her heart sang with happiness. Just then, along came Mr. Robin. "What are you doing?" he asked Portia. "Stay with me awhile and imagine there's a giant rainbow pouring colors on all the leaves." "Pish tosh," said Mr. Robin. "I have no time for such a silly thing as imagining. I am on my way to town to do the Very Important Work of nursing sick animals." Once again Portia felt ashamed. "Tomorrow," she resolved, "I'll put away my paints and my palette and my easel and get a job as a nurse and do something Very Important for the town. But that night as Portia lay in her bed trying to sleep, wonderful pictures of a giant rainbow pouring blazing colors into the woods kept dancing in her imagination. "I'll just paint one more picture," said Portia, and she got out of bed and painted the night away. All that autumn Portia worked very hard doing the Very Important Job of nursing sick animals back to health. She was happy to perform such a Valuable Service. But something was missing in her heart. She wished she knew what it was. By the end of fall Portia knew that, as important as nursing was, it just wasn't the right job for her. One crisp, cold day Portia trotted through the first snow of winter. Everything looked like it was covered with sugar that sparkled in the bright sun with little rainbows tints glistening everywhere. Portia imagined she heard laughter as snow people were being built. She felt the thrill of riding a sled really fast down a hill. And she imagined she heard fairies using tiny silver mallets to play heavenly songs on the glistening icicles hanging from the roofs. Portia thought that she had never seen anything quite so beautiful. As she imagined painting the beautiful scene her heart sang with happiness. Just then Mrs. Duck waddled by. "I'm having a wonderful time using my imagination," answered Portia. "Stop for awhile and imagine riding a sled while fairies play music on the icicles." "Pish tosh," exclaimed Mrs. Duck. "I am on my way to my Very Important Job of teaching all the children in town." And off she waddled to do her Very Important Work. Once again, Portia felt ashamed. But, once more, as she lay in her bed that night trying to sleep, wonderful pictures of snow scenes came dancing in her imagination. "I'll just paint one more picture," said Portia. And she got out of bed yet one more time and painted the night away. All that winter Portia worked very hard doing Very Important Work of being a teacher. She had been happy to perform such a Valuble Service but something was still missing from her heart. She wished she knew what it was. Now it was spring again. Portia knew she had to sit down and listen to her heart. So she sat down and she thought and she thought. She thought of the springtime and the sunrise on the lake and the pink cloud pony. She thought of the beautiful garden in the summer sunshine. She remembered the rainbow leaves in the woods in the autumn..
And she thought of the sparkly snow scene in the winter. "That's it!" she cried. "Now I know what's been missing in my heart all along!" "I wasn't meant to be a farmer or a letter carrier. I wasn't meant to be a teacher or a nurse." So Portia set out to do something about it. She knew that she had to be very brave and take a chance. "I can make them understand! I know I can! At least I have to try!" So she made a plan. First she sent out invitations to all the animals in town. "Come to the park on Saturday for a Big Surprise" they said. When they received their invitation - delivered by Mr. Frog, of course - the whole town was buzzing. Are you going to the park on Saturday?" Miss Horse asked Mr. Frog. "I'm much too busy for such foolishness," harumphed Mr. Frog. "So am I!" declared Miss Horse. "Still," said Mr. Frog, who was having second thoughts, "Portia did do me a great favor one day when I had the sniffles. She delivered all mymail for me and I don't want to be rude, so maybe I'll stop by just for a moment or two." "That's true," agreed Miss Horse. "When I hurt my leg Portia did my share of the farm work, so perhaps I could find time to stop by for just awhile, too." On the other side of town Mr. Robin and Mrs. Duck were having a similar conversation. "I'm sure it will be a waste of my Very Valuble Time," spouted Mr. Robin, "but Portia was awfully helpful to me when I had a sprained wing, so maybe I should go for just a few minutes." "Yes indeed," agreed Mrs. Duck. "Portia did a wonderful job of teaching my ducklings last winter, so I suppose I owe her a favor, too." The truth was, of course, that Mr. Frog and Mrs. Duck, as well as the rest of the town, were all dying of curiosity. They wouldn't have missed the Big Surprise for anything in the world. In the meantime Portia proceeded with her plan. She rented a gaily striped tent and she took all of her paintings from under her bed and out of her closet and behind her couch and even from her refrigerator and she spent all Friday night hanging them up inside the tent. She baked wonderful cookies and made lime punch. She bought rainbow colored plates, cups, and napkins and set them all up on the tables. When she finished she looked around to make sure she hadn't missed any important details. Everything looked festive and happy. And so on the big day all the animals in town came--reluctantly--one by one and in groups, to the gaily colored tent in the park. Portia greeted them cordially, as they stepped inside the tent. "So happy to see you, Mrs. Duck." "So very pleased you could come, Miss Horse." But once inside the tent, when they saw that the Big Surprise was only a bunch of Portia's frivolous paintings, they were very disapproving. 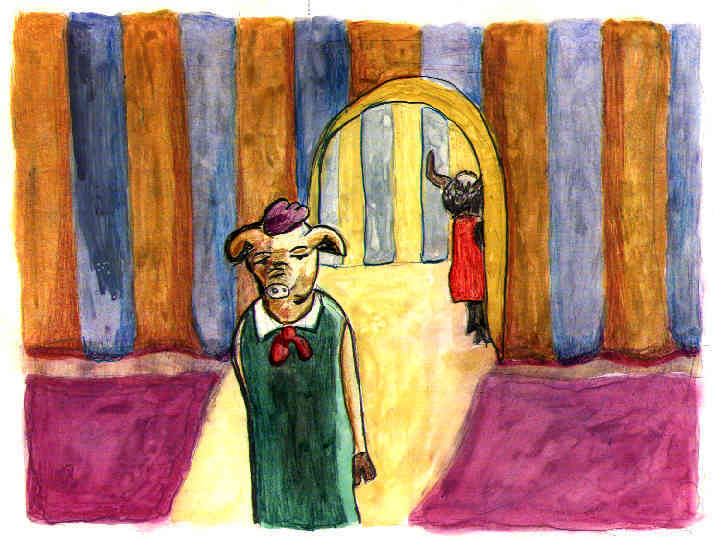 Portia's heart sank as she watched the frowns and listened to the murmur. "Oh well," she thought, "I did my best." But her heart was breaking. She turned to walk quietly out of the tent and go home to--one last time--put away her paints and her palette and her easel--this time forever. Portia heard Mr. Frog exclaim, "I can see it! I can see the pink cloud Pony! She told me it was there but I was so busy being busy I missed it!" "Yes, yes!" chimed in Miss Horse. "I can almost smell the flowers in this painted garden, and hear the bees buzzing! I had forgotten how beautiful it all was!" On the other side of the tent Mr. Robin was proudly telling Mrs. Duck that he had stood with Portia on the very spot in the woods last autumn, amidst all the blazing foliage, while at the very same time Mrs. Duck was trying to tell Mr. Frog that she knew all along that this winter scene would turn out beautifully, just absolutely beautifully. Well, a lot more happened that wonderful day but it is almost time to end this story. Mr. Frog admitted he'd always loved to make up songs which he sang very late at night when he thought no one could hear him. Miss Horse confessed that she occasionally liked horsing around doing a dance step or two. Mr. Robin said he had been known to write a poem or two in his day, especially haiku which he found particularly satisfying. And Mrs. Duck admitted shyly that she did always very much enjoy writing and telling stories to her ducklings. So it was agreed that from now on, a Very Special Day would be set aside once a month for the whole town to gather and share their music and paintings and poetry. The plans were put into effect immediately. Portia sold every single one of her imaginative paintings and they now hang in the library, in the shops, and in the living rooms all over town. Not only that, but by Special Proclamation the town also made Portia the Official Town Artist--a Very Important Job, indeed!--because she could see and hear and smell and feel and imagine!--things that the others had all been to busy to do. And best of all--the Very Best of All-- Portia Pig was supremely happy because, at last, she had found the song in her heart. When I first read Portia's story to my very active eight year old grandson, Steven Tate, he was immediately entranced and inspired. He asked for paper and a pencil and proceeded to write his very own short story. And two more the next day! If you are similarly inspired to write a story or a poem or to draw a picture we would love to have a copy. Perhaps we could have a book of art inspired by Portia. Wouldn't that be wonderful?